I often talk about or feature high-end beauty and luxury skincare brands on the blog, but there are SO many items I use on the reg that come from the drugstore. Some I’ve shared before (either in a past blog post or YouTube videos), others I haven’t, but here is a rundown of my must-have beauty, skin and hair products that you can buy on any budget at your local CVS, Walgreen’s, Duane Reade, Target or Rite Aid! Simple Skincare Cleansing Wipes – if you watched my nighttime skincare routine video, you’ll know using one of these wipes is the first thing I do every night. They gently remove every speck of makeup from my face… even the most stubborn waterproof mascara! 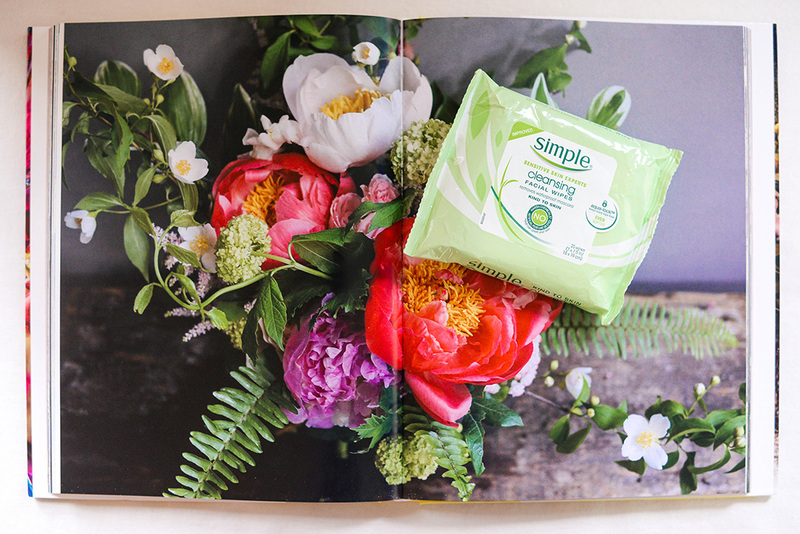 Before these wipes, I hated makeup removes. They’re either too oily and leave behind residue, or too harsh and burn my skin/eyes (looking at you, Grapefruit Neutrogena Wipes!!). These Simple Skincare Cleansing Wipes have absolutely changed the game. I never leave town without them! CoverGirl Clump Crusher Mascara – this product is an absolute makeup must-have for me. I used to only use Diorshow mascara, but when I gave ClumpCrusher a try I’ve never looked back! One of my biggest pet peeves is having clumpy lashes, and ClumpCrusher is the only mascara I’ve tried that can thicken and lengthen my lashes without making them look spidery. The bristles on the brush are super stiff (almost sharp! ), so if you really drag them through your lashes as you’re applying it, the brush will completely separate each individual lash. I usually apply three layers! Use along with Neulash (a lash serum I apply every night before bed! A tutorial can be found here – it’s a bad video, I apologize!) and it will change your life! Never mess with eyelash extensions again. Revlon Moon Drops Lipstick in Hot Coral – this is my absolute favorite red-orange lipstick to sport in the spring/summer months. It’s a super creamy formula, that’s sort of at a crossroads between matte and shiny – it’s just right! It provides the perfect punch of color to jazz up my everyday makeup look. Aveeno Ultra-Calming Foaming Cleanser – while I use my Biologique Recherche face wash as part of my nighttime skincare routine these days, I always keep Aveeno Gentle Foaming Cleanser in my shower. While my face is certainly clean if I’m just getting up and hopping in the shower in the morning, most days I’ve just come from FlyWheel or finishing BBG. I always wash my face in the shower to rinse off sweat and rebalance my pH. I’ve used this Aveeno cleanser since college! If you have sensitive skin, this face wash is the best! Jergen’s Natural Glow Self-Tanner – now that the heat is rising in Texas, I’m wearing more and more items that show off my legs. In order to prep my super pale stems, I always reach for Jergen’s Natural Glow! This is another product I’ve used for years. It’s a gradual sunless tanning lotion that gives you full control over your color. I’ve never been able to do spray tans – I always end up looking orange and I hate the streaky, dirty look they leave on your skin. With Jergen’s, I apply it every day until I reach my desired shade, and then use every other day (or every two days) to maintain the color. It’s super easy to apply (and apply it well), it’s inexpensive and you can do it on your own time right after you hop out of the shower! No more scheduling appointments and avoiding people for the first day. What are some of your favorite drugstore skincare, hair and beauty finds? Anything you think I need to try? Instead of wipes, have you tried Micellar Water? Target sells it (Garnier brand, which I happen to use). It’s cheaper than wipes (a bottle lasts me like 6 months), and if you use reusable makeup pads (I use these from Target: http://www.target.com/p/s-w-basics-eco-cotton-rounds-8-count/-/A-16542545), it’s more eco-friendly. I used to use the wipes, but I’ve actually found Micellar water to remove my make-up more effectively, and it leaves literally no residue or oiliness or anything. It literally feels like you’re using plain water on your face. I swear I’m not a representative for it, I just really like it, and I find the wipes to be wasteful. Either way, nice post! I might try that CoverGirl Clump Crusher (I currently use their Plumpify Blastpro).